﻿Use this beautiful evergreen as a specimen planting where it will not be crowded and has plenty of room to spread. Depending on the structure of your tree it can reach a height of 10-15 feet and a width of 8-10 feet across and would be difficult to transplant once established. As your tree matures its cascading branches will drape down to the ground giving your tree grace and charm. Weeping Blue Atlas Cedar takes on its own unique shape. 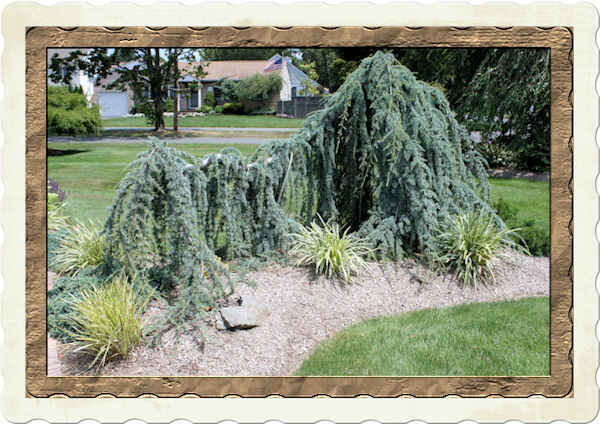 Weeping Blue Atlas Cedar is not prone to any particular pests or diseases. Another plus is that they are also deer resistant! They do benefit from an early spring feeding and should be protected from strong winter winds. If you have clay soil break up the soil and add gypsum, which will help to improve drainage, or if the clay is very compact use a post-hole digger to dig down and add gravel to help water flow. When planting, allow this specimen plenty of room to grow so that it can reach its full potential. If you are looking for something different, this specimen tree will highlight your landscape and bring you many years of enjoyment. Its silvery-blue needles and beautiful weeping habit make it an excellent addition as a focal point in the garden…an attribute that will only improve as your tree matures in age. Its a very beautiful plant but I don't know if its available in my part of world or not but I definitely give it a try and search for it. Very inspiring post. Thank you for visiting and for your comments. In colder portions of the world you might like to try Colorado Blue Spruce (hardy to Zone 2) for the same blue color. There is also a weeping form of this plant. I purchased a home that has a 30 foot wide weeping atlas blue cedar. It is a beautiful tree that has grown to overshadow the beauty of the house. The previous owners had no idea of the treasure they had growing in their front yard. Is there anyone I can consult for information on selling this tree so that it may be placed in an environment more fitting. That sounds like a magnificient tree. I would suggest contacting local nurserys or growers to see if anyone has interest in it. For a tree that size a tree spade would probably be necessary to move it which can be costly. If the grower or nursery has a customer who would be interested in the tree then it may be worth the digging/moving expense. Probably the best bet would be to keep asking around as you are here and maybe there will be someone with interest. You could also try contacting any local builders of new homes looking to landscape them. The Upright Spiral Blue Atlas tend to stay slimmer but the tree will send lateral branches outward that can get quite extensive. The key is to maintain the width by pruning the lateral branches to keep them tighter to the tree. It is a beautiful specimen of a tree. You will probably grow to love its unusual shape-each one unique in its own way. I'm so happy I found this website - I had a W.B.A.C. planted next to my house (an end-unit row-house in DC) about 22 years ago and it's approaching 18 feet in height. I never trained it to spiral or pruned it to keep it short; it has just towered upward in its own twisty way and appears to be quite healthy. My issue is this: the tree is about six feet away from the house and there is a sunny space between the house and the tree which would be perfect for another of my favorite shrubs (Fothergilla). The tree trunk near the base is about a foot in diameter and the hole for the shrub would be about three feet away, but I'm very concerned about having to cut tree roots to dig a hole for the Fothergilla. I would buy just a one-gallon-sized shrub to minimize the impact but I'm still worried - what are the odds of damaging my gorgeous weeping Blue Atlas Cedar? Thanks! Your Weeping Blue Atlas Cedar sounds like a magnificent tree and probably has an extensive root system. Generally tree roots extend to the outreach of the branches. If you have concerns about digging near your mature tree I would suggest avoiding it. You can still get you Fothergilla but plant it in a spot where it can grow. I believe they grow to about four feet. To fill the gap between your tree and the house perhaps you can add a nice boulder as an accent and the tree branches can weep over which could add a nice touch. Hope this helps. Generally speaking the leader branches that extend to the ground give the tree more interest, especially as they start to fill out. Without actually seeing the tree the best advice I could give you is to do some selective pruning and train the branch to go in a direction away from the other shrubs. You did mention that the tree is no longer looking as "artistic" so go with your instinct and prune a little at a time-nothing drastic. Hope this helps. Thanks. How would I post a picture? Maybe then I could get some artistic feedback. One thing I was thinking was to use it to start another serpentine or spiral going up in the space. That would keep it out of the roses going around the gazebo. You can e-mail me a photo. I think your idea of creating another serpentine is a good one! We are planning to plant a weeping atlas cedar right next to our garage - about one foot away. We want to stake and train it to grow along the garage wall. If we keep it trimmed will that also keep the roots from becoming extensive? The garage is 6 feet from our house and this "alley" space is also the walkway to the back yard. We don't want above ground roots to be a source of tripping. Is there a way to plan the tree to avoid above ground roots? Also - do you see any problems with our plan? --- actually the space between the house and garage is 11 feet. Thanks for any help / advice you may have. Weeping Blue Atlas Cedar really doesn't pose a threat with above ground roots but the tree does get large over time. Also pruning the tree will not stop the roots from growing. I'm not sure about the location because the tree will grow quite large but if you buy a narrow tree to begin with and train it to grow to one side it could make a nice specimen. Make sure you have full sun and good drainage as well. I hope this helps. It's hard to say without seeing the site. We are in PA and have missed the spring pruning of the atlas cedar. This is the first year we have had it. There is a lot of new growth lying on the soil and we do not want to have to worry about fungal disease (we have many varieties of fungus growing on the mulch near the tree due to all the rain). Is it too late to prune? Not at all! You can prune off the branches that are hitting the ground any time...just not too close to winter since the tree needs time to harden off before freezing weather. Sorry, I'm going to post this again as I do not think my question was saved. We are looking to have the ceder in a flower bed behind our pool. The bed is about 10 feet deep and 20 feet long. The tree would be placed about 8 feet from the pool and 8 feet from the underground plumbing for the pool. My concerns are that the root system of the tree may cause problems with the fiberglass pool or plumbing. Also while I would expect needles to drop, is it so bad that I would need to spend my life cleaning up the pool. The pool is Salt water. Hi Scott-Sorry it took a couple of days to get back to you. This is my busy season and I have less time to go onto my computer. It sounds like you have enough spacing for the tree to grow. I often use Weeping Blue Atlas Cedar as a specimen tree by a pool waterfall since they are a beautiful tree and have a graceful cascading appearance. As long as you are giving it adequate space it should grow beautifully. As far as the needles dropping-cedar usually shed needles in late winter/early spring but not like the needles of a white pine so it really doesn't create a mess. Hope this helps. Hi, I'm glad I found your site. 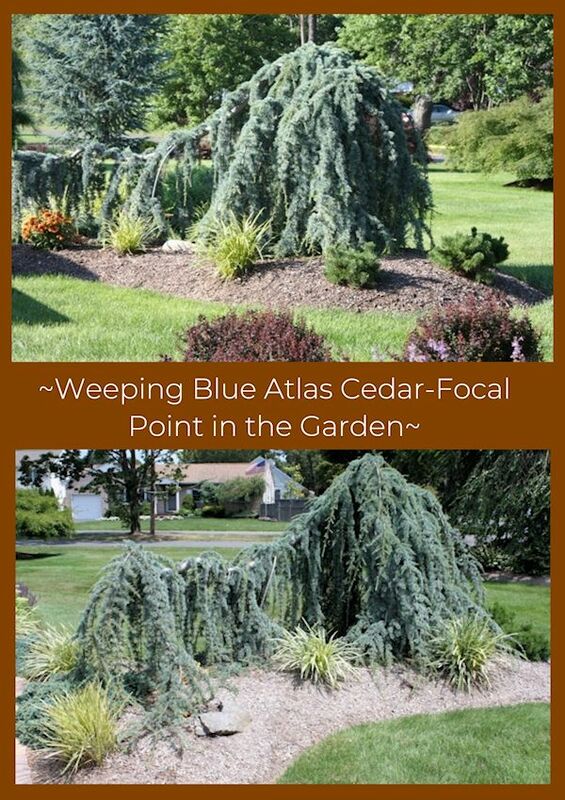 We have what I believe is a blue atlas weeping cedar. It was planted about 5 or 6 years ago, but the guys that put it in faced it so it is now starting to encroach the side walk. They should have turned it, but too late now. I was wonder if I can trim it back or how to do it. I would hate to damage it. Can I send a picture to you for a suggestion? Thanks! You can trim the branch that is getting too large but do not chop the whole piece off. Prune it up a little to where new shoots are coming out to encourage the new growth to go in a different direction. Sure you can send me a picture. It doesn't sound good but give it a chance through the winter and perhaps it may come back in spring. It sounds like it has gone into shock. There are treatments on the market for trees in distress. One is called BIO-PAK that contains a yucca and nutrient treatment to help the plant get established and maybe save it. Hope it works for you. I just purchased a Weeping Blue and I live in NC. I was told that they do not like a lot of sun. So I was wondering if that was true. I can plant this in several areas at my house I just want the best location. Weeping Blue Atlas Cedar thrive in full sun and prefer it so plant away but give it lots of space! A very harsh winter here in western Michigan has really taken a toll on my Weeping Blue Atlas Cedar. Mine is about 10 years old and has done great up until this winter. I am hoping for a recovery, 50% of the needles are brown and it just doesn't look very good. It was a harsh winter here as well. Try the BioPak Plus or deep root feeding...see post: http://landscapedesignbylee.blogspot.com/2011/02/winter-burn-on-blue-atlas-cedar-and.html#.U1PpFfldV8E for more info. Good luck with your tree. So glad I found this page, I had a question I hope you can answer. I know this tree thrives in zones 6-8 but do you think it could survive in a 5a zone? Sure can. Weeping Blue Atlas Cedar are hardy in zones 6-8. That means that zone 6 temperatures are the lowest the tree is likely to thrive in. Zone 5a winter temperatures would most certainly take a toll on the tree and chances of survival would probably be slim. When purchasing a tree always go a couple of zones lower. For example if you are in Zone 5a, purchase plants that are hardy to zones 3 or 4. My weeping Blue Atlas Cedar lost its middle third of needles over the winter, perhaps from deer rubbing, or grazing? Or because of our terrible winter winds here in SE Mass.? (It's been in that location for five years.) There doesn't appear to be new clusters of needles developing along the bare areas of the branches. What, if anything, can I do to restore the plant to its former beauty? I would recommend having it deep root fed with a good mixture of helpful bacteria and nutrients. A certified arborist could do that for you or you could purchase a product called BioPak Plus and apply it yourself. Give the tree some time...it was a very harsh winter and it may take some time to recover. Hi Bill. With a weeping bllue atlas cedar that large a significant pruning may sacrifice the shape of the tree and possibly cause too much stress. If you can get away with a slight shaping you can do so or perhaps have the tree professionally dug and moved. You may also be able to find a buyer for the tree. Sometimes large nurseries are looking for mature specimens. It doesn't happen often but you could try reaching out. Hello, what are the lower plants in the picture? I would like to get them as well. Also, can you recommend any accompanying perennial plant with color to go within 4 or 5 feet of the Blue Atlas Cedar? Thank you. The plants in front of the Weeping Blue Atlas Cedar are Variegated Liriope and Mugo Pine, all of which have matured over the years to fill in the space around the tree. There are many perennials that can be added...Salvia and Daylilies, for example, would complement the tree nicely. After these pictures were taken, I had opened up the size of the planting bed and a put moss rock border with Sedum 'Brilliant' outside of the Mugo Pine for additional color. I have a fairly small weeping blue atlas cedar located in my front yard in WA. I had all my trees/bushes trimmed in June and I just noticed this week that all the needles have fallen off! I'm not sure if it has been affected by fungal as you mentioned in the post but I was planning on getting some of the BioPak Plus. Is there anything else I should be aware of? It could be a number of things such as disease, over or under watering or too much mulch piled up around the trunk, causing root girdling or lack of oxygen. It's hard to diagnose without being there, but I would suggest checking each one of those things. The BioPak Plus is good for helping plants in stress, but I would also consider the other factors and perhaps have an arborist look at it first hand. If the needles have spots on them, it is an indication of a fungus and would require spraying with a fungicide. We have a WBAC that has lost all of its needles in the past 3 weeks after having multiple days of 100+ degree heat. First noticed the top layer of needles were browning, then more brown and the needles started falling off during a bad thunderstorm. We have had the WBAC for about two years and it has been thriving up until now. Nothing has changed around it. It is approximately 6 feet tall. Should we trim anything or leave it alone until the spring and see what happens? It sounds like your tree is losing its needles due to heat stress. It is a defense mechanism. Scrape a small portion of the outer bark away to see if it's green and if so, drench the tree with BioPak Plus, a nutrient/beneficial bacteria mixture and repeat every three weeks for two to three applications. Do not prune anything off the tree right now, but give it time to recover. When a tree gets stressed from heat it can also become more vulnerable to insects. To be sure, check for Spider Mites, an insect which can cause needles to suddenly drop. Hold a white sheet of paper under the branches and tap the branch above to see if there are any tiny orange-red specks crawling on the paper. If there are spider mites, the use of Neem Oil or Malathion will control them. Also check the trunk for Borers, which can also weaken a plant to the point where leaf or needle drop occurs. Check the trunk and branches for small pin size holes that may have sap flowing out. If borers are present there are insecticides on the market for borer control. Hope this helps. Do you know how the atlas cedar root system grows?. I'm thinking of a place to plant this tree in my garden but I wonder whether the main root grows vertically or on surface, and if it grips properly to the ground. From my experience, Weeping Blue Atlas Cedar can grow to be very wide in diameter and have a pretty extensive root system. The roots generally go down deep, so you can plant around it, but give it plenty of room to grow! Hi! We moved into our house in Sept 2016, and the Blue Atlas was a healthy 6-7 ft tall. Well, after the winter, we noticed the entire upper half of the tree looked dead; the bottom branches going down looked healthy and had needles. I went into a regarded nursery in my area (Northern VA) and he suggested, based on photos and sample branch, that I cut off the upper dead main branch until I reached the "live" area, then make sure I fertilize it and keep watering it. I did that, and it seems the bottom branches are moving outwards. of course, that could just be wishful thinking on my part. What do you think? I can supply you photos if you'd like. As a follow up, someone (not the one who helped me) mentioned spider mites. I didn't see damage from borers. Hi Steve. Sounds like winter damage, but it's difficult to say without seeing the tree. 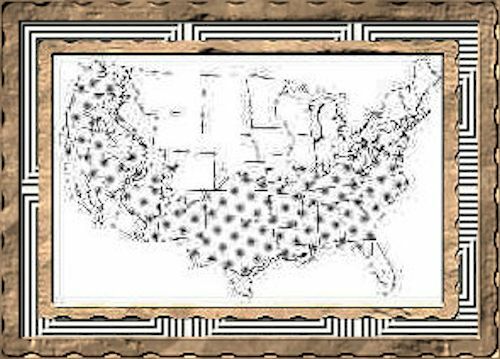 It is probably best that you have an arborist from your area take a look at it.